The government is spending more than £9m on sending a leaflet to every UK household setting out the case for remaining in the European Union. It says the 14-page document, to be sent to 27 million homes, responds to public demand for more details about the EU referendum by setting out the facts behind the government's position. Leave campaigners reacted with fury. Boris Johnson said it was wrong to try to "stampede" voters while Nigel Farage said the document was "full of lies". UKIP leader Mr Farage said the exercise was a "scam" and reinforced his view that the EU referendum on 23 June would be "defined by the battle of the people against the political elite". But David Cameron tweeted that "key facts" outlined in the document explained why the government believed "we are stronger, safer and better off in the EU". Royal Mail will start delivering the leaflets - entitled Why the Government Believes That Voting to Remain in the EU is the Best Decision for the UK - to households in England next week and in Scotland, Wales and Northern Ireland after the 5 May devolved elections. A digital version is being advertised on social media and is available on a new website. The government says the mail drop will cost £9.3m, or about 34p per household. The designated Leave campaign, and its Remain opponent, will be able to spend up to £7m each on advertising and promotion once the official campaign period starts next week. This includes £600,000 of public grants set aside for free mailshots and TV broadcasts. Katie Ghose, of the Electoral Reform Society, said "rushing" to spend £9.3m on the mail drop before stricter rules kicked in could make people feel the government was "playing fast and loose with the situation". A similar leaflet to that being issued was sent out by the government during the 2014 referendum on Scottish independence and in the 1975 referendum on Britain's membership of the European Community. But in 1975 the leaflet contained a picture and a signed introduction by the then prime minister, Harold Wilson. The latest leaflet does not include any images of David Cameron. Instead, the leaflet is plain and official-looking, containing pictures of workers, shoppers and families, and concentrating overwhelmingly on what the government sees as the economic case for staying in the EU. It claims that "over three million UK jobs are linked to exports to the EU" and that "if the UK voted to leave the EU, the resulting economic shock would risk higher prices of some household goods". Officials described the document as "a straightforward, sober representation of the government case", designed both to change voters' minds and encourage others to register to vote. They said internal opinion polls suggested 85% of people wanted the government to provide more information so they could make an informed decision on 23 June. Environment Secretary Liz Truss said the leaflets would help voters do so. She also emphasised the government's view that EU membership "brings economic security, peace and stability". The government said the leaflets had cost £458,500 to produce and £5.94m to print and deliver across the UK. An additional £2.89m had been spent on the accompanying website and "digital promotion". But the move was met with thinly disguised anger by groups campaigning for EU exit. "I think it is deeply disappointing that the government is going to spend taxpayers' money in a bid to distract the media headlines away from the allegations of offshore banks that have dogged the prime minister," Robert Oxley, a Vote Leave spokesman, said. "Our money should not be used on propaganda, trying to buy votes. We already send £350m to Brussels each week. We should spend our money on our priorities like the NHS." 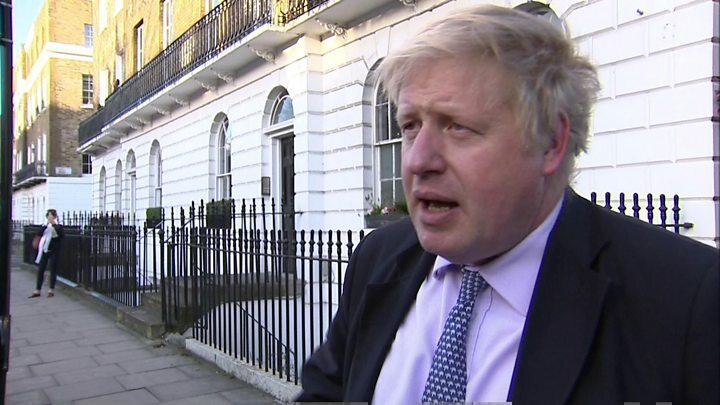 London Mayor Mr Johnson, one of the most senior Conservative politicians to back leaving the EU, said the move was a "crazy waste of money". Both sides needed to be able to put across their arguments fairly to guarantee an "informed" debate, he said. Conservative MP Bernard Jenkin, a prominent supporter of Vote Leave, said it was "an outrageous abuse of taxpayers' money" which "flies in the face of the government's claim that they want a fair referendum". "In this one act, the government will spend more on their Remain campaign than the official Leave group will be able to spend between now and polling day," he said. Conservative MP Peter Bone, from Grassroots Out, said the move was a "major error of judgement" by Mr Cameron. "The prime minister promised Parliament that no taxpayers' money would be spent promoting Remain or Leave," he said. "What is being done is immoral, undemocratic and against what the government has promised. If this is not reversed it will seriously damage the prime minister's reputation." But former immigration minister Damian Green, a Britain Stronger In Europe campaign group board member, said ministers were giving people the information they had been asking for. He told BBC Radio 4's The World Tonight: "People have been crying out for facts. The government has produced a factual leaflet. Both sides will get a leaflet funded by the Electoral Commission during the actual period itself. That's what's fair." Officials said it was entirely legitimate for the government to make its case and said there was no legal reason why it could not do so. The decision to send the leaflet was agreed by the Cabinet sub-committee on the EU and was signed off by Cabinet Secretary Sir Jeremy Heywood. Speaking in Parliament last June, Foreign Secretary Philip Hammond ruled out sending mail shots during the so-called "purdah period" - the last 28 days before the vote when any official government role in the campaign will be banned. The government faced a backlash from Conservative MPs last autumn when they sought to relax the rules limiting ministerial activity in the immediate run-up to the poll, only backing down after losing a parliamentary vote.